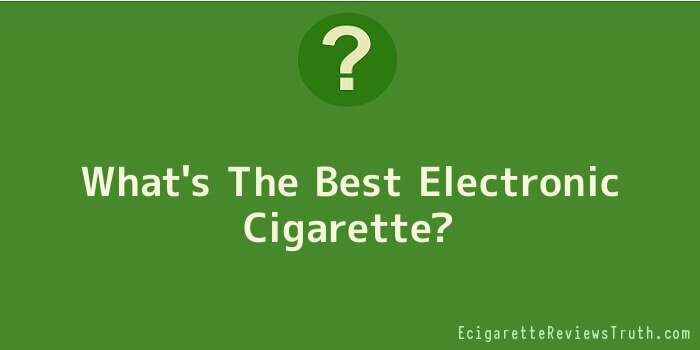 What's The Best Electronic Cigarette? Since there are so many brands on the market and the prices vary greatly, you might be wondering what the best electronic cigarette is. Here’s what I have learned. Although they may look different, most brands have the same components. The components include an atomizer, an LED light, a battery and a cartridge containing a liquid solution. The LED light is strictly meant to imitate the appearance of the burning end of a cigarette. The first company to release the products is called Ruyan, which in Chinese means “to resemble smoking”. LED lights come in a variety of colours to allow the consumer to “customize” his or her e-cigarettes. The atomizer vaporizes the liquid in the cartridge, which fits into a mouthpiece that usually resembles the filter-end of a cigarette. In the disposable e-cigarettes, the atomizer and the cartridge are included in a single unit, sometimes referred to as a cartomizer. The batteries provide the energy needed for the atomizer to work. Some companies include disposable batteries. Others include rechargeable batteries. Evaluating the quality and lifespan of the batteries will help you decide what the best electronic cigarette is. If the batteries must be replaced too often, then it will add to your costs. Cost is the thing that most people consider when comparing brands. While everyone wants to get a good deal and save money whenever possible, it doesn’t make sense to sacrifice quality for a low price. If you get a cheaper brand, you might not enjoy using it. If you don’t enjoy using it, you will continue smoking your regular brand of cigarettes. The first models were manually operated. You pushed a button similar to what you see on a fountain pen in order to make the atomizer work. Today’s more advanced models work automatically. A sensor inside the mouthpiece automatically turns on the atomizer, making the experience almost identical to smoking cigarettes. The flavour and the nicotine content are other factors to consider. Nicotine is the addictive substance, but not necessarily the most dangerous substance in conventional cigarettes. There are thousands of chemicals in tobacco smoke. Most of them are cancer-causing chemicals. Nicotine, itself, is not a carcinogen. The real answer to what’s the best electronic cigarette is this. It is the one that you like best. The more you like it, the less likely you are to smoke “real”.